We had Kielbasa Sausage a la Fenway Park for Bob’s birthday dinner. The sandwiches are practically a whole meal all by themselves so I wanted a light side dish to serve with them. 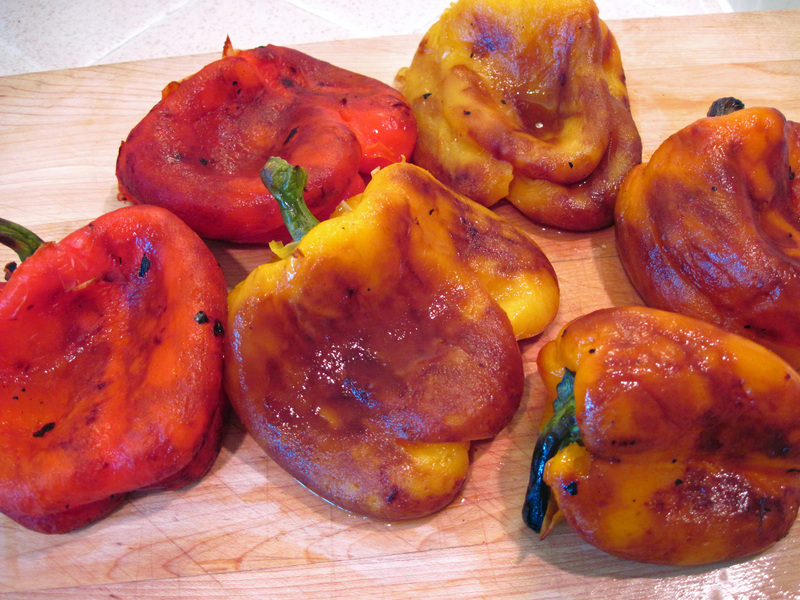 Roasted Bell Peppers were perfect! 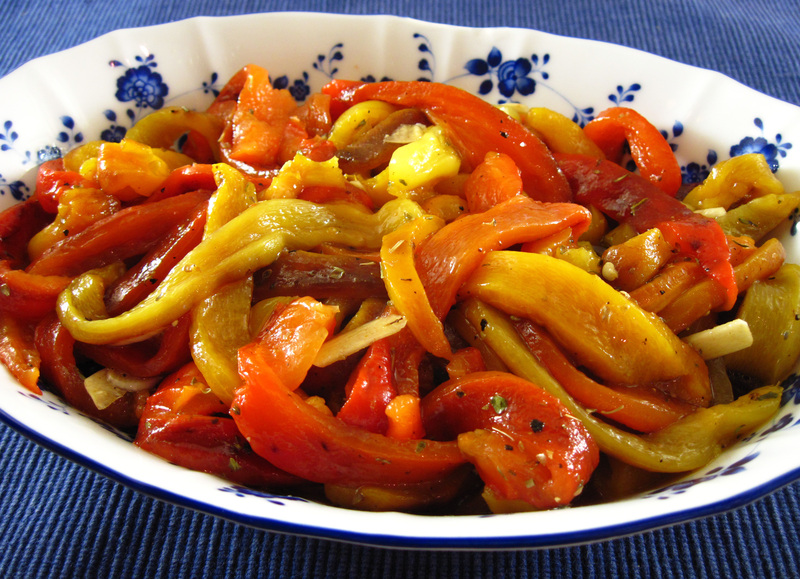 I found the recipe for Roasted Red Bell Peppers on epicurious. The original recipe was published in the May 2005 issue of Gourmet magazine. It called for 5 red peppers; I used 2 red , 2 yellow, and 2 orange peppers. This is a recipe that tastes fantastic at room temperature. I made it in the afternoon and it was all ready for dinner. I love make-ahead dishes for entertaining! 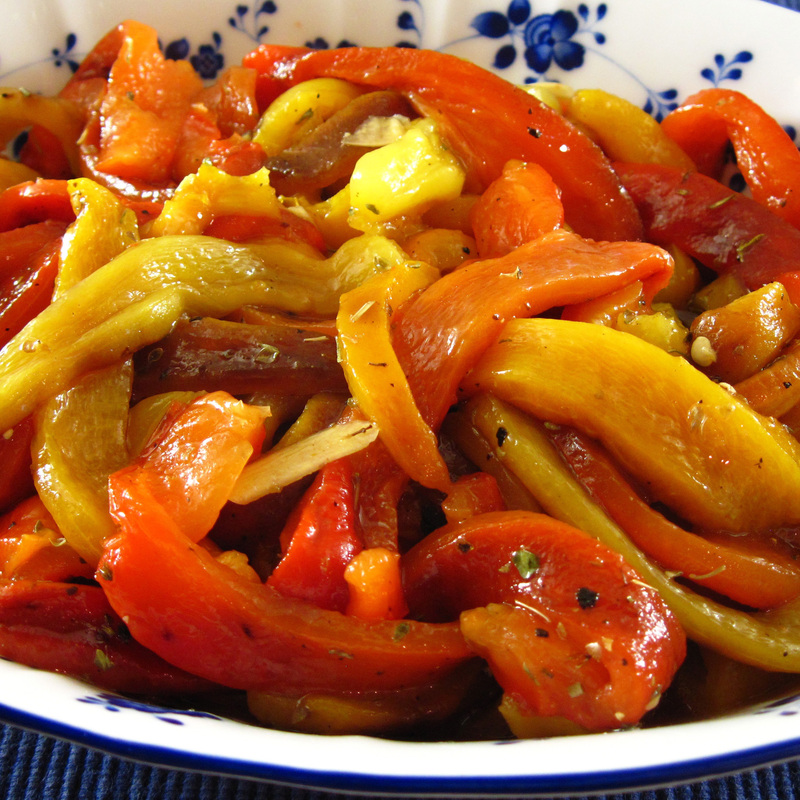 The Roasted Bell Peppers were excellent as a side dish to the kielbasa. Bob actually enjoyed some of them on his kielbasa. They would be a welcome side dish with any grilled meat or fish. You could also use them as an appetizer as part of an antipasti platter. Give them a try. I think you’ll like them! 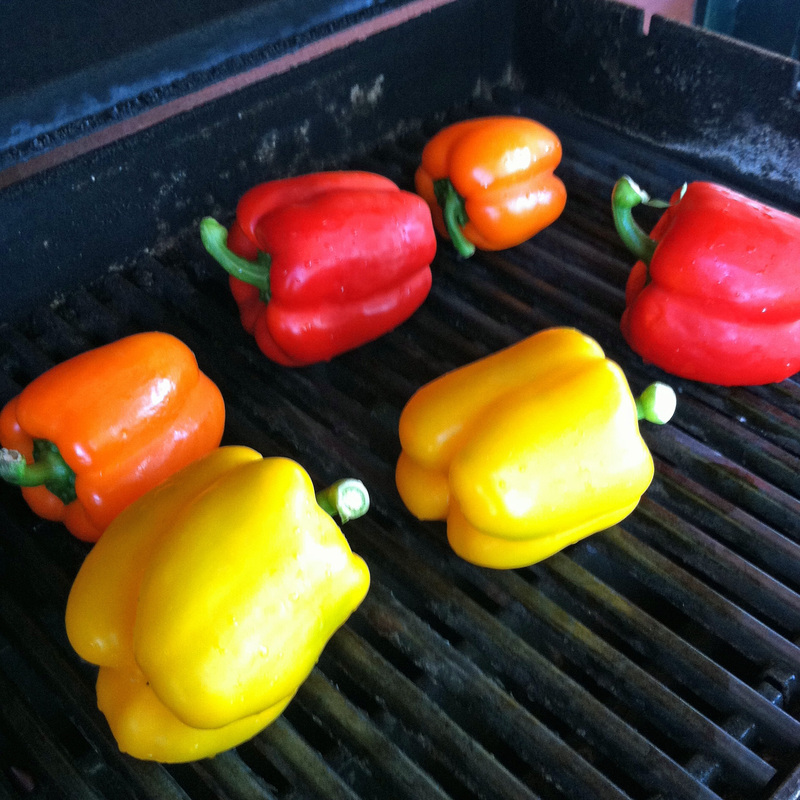 If you don’t have a grill (or don’t want to use it), you can put the peppers on a foil-lined baking sheet and broil them until they are charred on all sides. 1. Heat your grill on high for 10 minutes. 2. Turn the heat to medium and put the peppers on the grill. 4. 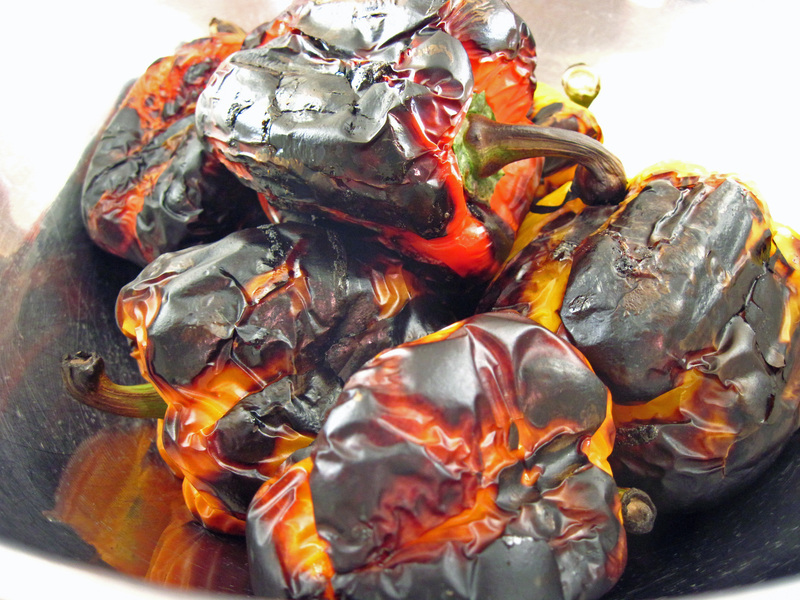 Remove the charred peppers from the grill and put them in a large bowl. Cover the bowl with foil and let them sit for 10 – 15 minutes. 5. Take the peels off of the peppers. Cut them in half and remove the stems and seeds. Slice the peppers into thin strips. Try to reserve some of the peppers juices as you cut them. 6. In a large bowl, whisk together the garlic, olive oil, balsamic vinegar, oregano, salt, pepper, and any juices that you were able to reserve. 7. Stir the pepper strips into the marinade and marinate at room temperature for at least 30 minutes.